"Wokingham Bridleway protest Horse riders trotted through Wokingham to highlight the lack of access to off road routes"
Horses and their riders have trotted through a Berkshire town to highlight a campaign to increase off road access. A petition is calling for riders to have access to 30% of all routes on the Rights of Way network across the UK by 2030. 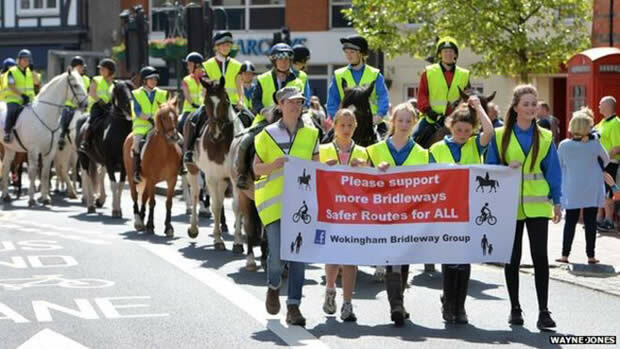 More than 40 riders marched through Wokingham to show how many exercise their horses on busy main roads. It is estimated 3,000 accidents involving horses happen each year on UK roads. Currently, the national average of off road routes available to horse riders is 22%. Nicola Greenwood, a Wokingham rider, said riding is being further threatened by plans for 13,000 new homes in the district. "Surveys we conducted last year on behalf of the Wokingham Bridleway Group found 2,228 horses registered with owners across the district, but only 10% of routes on the Rights of Way network are accessible to them," she said. "That's a long way below the national average. We would like to see a plan of action developed with the borough council in light of future developments to see where we can work together to improve that figure." "BHS should be utterly ashamed of themselves." Most of us don't give a stuff about cyclists, they have plenty of funding spent on their sport whereas we don't. They also have the same access rights as we do to the minor roads, so why aren't they doing more to make those safer for all? BHS should be standing up for its members and asserting our customary rights, plus of course the confidence to use those rights. Acknowledge that we are being disenfranchised by the cycling lobby who do not 'give way' to horse riders on bridleways but use them for racing instead. Many of them do not seem to know or understand that they have a concession only. BHS should be lobbying to have that concession removed since many of us find their presence at best inconvenient and at worst down right dangerous. It was the BHS who encouraged the introduction of cycles under s.30 of the 1968 CA in the first place and now are herding all of us on to multi-user. They should be utterly ashamed of themselves. The point about Meon Valley is that the BHS's working with HCC has produced this protest march because of a singular lack of consultation!